From February 15th – 19th, 2018, Hunter Douglas attended Modernism Week in Palm Springs, California. The annual event honored mid-century modern architecture, design, art, fashion and culture. The week consisted of more than 350 events, including discussions and presentations with leaders in the field, architecture tours via double-decker buses, home and garden walking tours, films, parties at the former homes of Frank Sinatra and Dinah Shore, along with home and building tours. 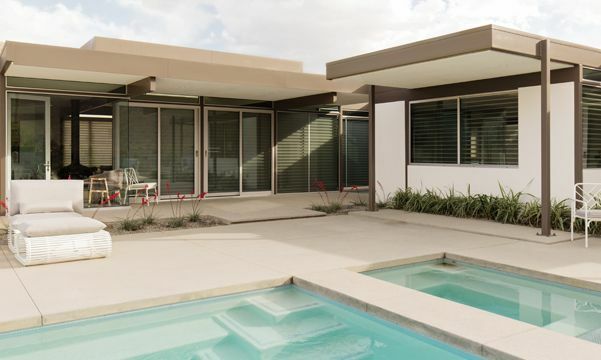 Hunter Douglas worked with the Steel and Glass House, a modern-day classic post and beam modeled after Donald Wexler’s iconic architecture and designed by Marc Sanders. The house was built in 2012 and is praised as the perfect illustration of modern contemporary desert architecture and design. Hunter Douglas’ Silhouette ClearView™ shadings were installed throughout the home, which were the perfect solution for energy conservation and UV protection while still allowing the beautiful vista views to be visible and take center stage. To celebrate the beautiful home, Hunter Douglas hosted a “Day of Design” event in collaboration with Traditional Home Magazine which welcomed the Palm Springs community, designers and media. 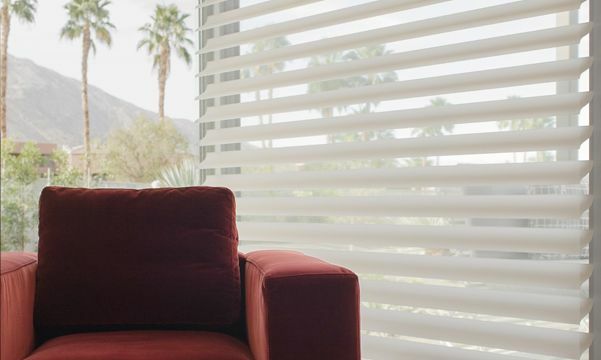 Hunter Douglas was also very pleased to see their shades throughout Palm Springs in notable homes such as the famous Edris House and the Moroccan Modern. The latter represents a marvelous blend of Moroccan and mid-century modern design. In December 2004, Cyndi Roberts founded Blinded by Delight Window Coverings & Design as a shop at home service. Due to the tremendous response and growing clientele, we officially opened our Hunter Douglas gallery in 2013.The primary goal at Blinded by Delight is to educate our clients on the various options. There are many products and vendors with all different price points. The finished product is our client’s choice based on what is most important to them: be it price point, versatility, or uniqueness for their home. Whether you are looking to spruce up your living space, update your home decor with contemporary window treatments or simply modernize your blinds and shades we have excellent specialists that will assist you in finding the best selection for the vision you have in mind for your custom window coverings. Schedule an appointment today. It’s free, there’s no obligation. Come to our gallery to see all the options on display. Our Hunter Douglas Showroom is one of the best in the region! We ask that you bring your basic measurements of the custom window coverings you are interested in installing, as well as photographs when possible. Once you are ready, we will schedule an in-home appointment where we will take detailed measurements in order to finalize your project. Simply click on Schedule An Appointment or call 210-336-5266. Our hours are Monday through Friday, 9:00am to 5:00pm, and Saturday, 10:00am to 4:00pm.